If you are using MINDBODY Online as software to run your business you need to understand how to properly record your sales information in QuickBooks. Much like any point of sales system you need to find a sales report in a format that works for your business and record a daily sales journal entry in QuickBooks. You also need to look at the flow of money into your bank account to understand how to set up your journal entry. I will walk you through the process of how to run your MINDBODY sales report, set up your QuickBooks sales journal entry and properly record your daily sales in QuickBooks. This short video below demonstrates the entire process for you. The report you want to run from MINDBODY that best summarizes your daily sales and payments is the 'Daily Closeout' report. When you log into your MINDBODY online portal click on 'Reports' from the main menu bar. Once in the reports section scroll down and find your 'Daily Closeout' report. Like any daily sales report it is important to run the report for each individual day's sales. This is due to the manner in which your funds hit your bank account. You need to mirror the way funds are deposited into your bank account, which is typically on a daily basis. You need to take your daily sales report from MINDBODY and set up a daily sales journal entry as a QuickBooks memorized transaction. You should use your daily closeout report to set up a QuickBooks journal entry that represents all of the possibilities of your daily sales activity. 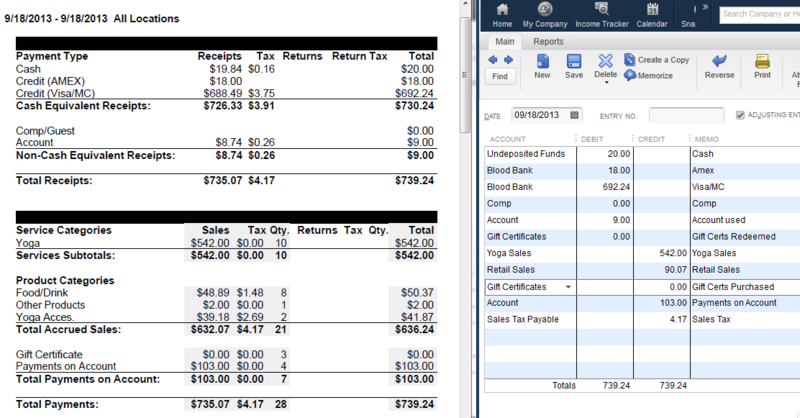 I have an example below of a MINDBODY daily closeout PDF report and a QuickBooks daily sales journal entry. Here is a summary guide of how to set up a QuickBooks daily sales journal entry based on your MINDBODY daily closeout report. Cash and Credit Card Payments - These will be debits to your bank account or undeposited funds account. I used the QuickBooks undeposited funds account for cash and check payments as they should be stored there until the payments are physically deposited into the bank. Once cash and checks are deposited in the bank you should move them from undeposited funds to the bank account via the 'Record Deposits' function in QuickBooks. Credit card transactions get linked directly to the bank as they will eventually be deposited to your bank by your merchant processor. You need to create a separate line in your journal entry for each group of credit cards transactions depending upon how they hit your bank. As an example most merchant processors settle American Express separately from Visa, Mastercard and Discover. The screenshot I've given above illustrates this. Comp/Guest - I set up an expense account called 'Comp' and debit this account in the journal entry. This will give us an understanding in QuickBooks as to how many comps we've given out and where possible lost revenue might be hiding. Account - I set up an other currently liability account called 'Account' and debit it for account funds used. Gift Certificates - In this section these are gift certificate redemptions and should debit the gift certificates liability account. The sale is recorded at the time of redemption and the gift certificate redemption is the payment method. Why this is recorded as an other current liability is because when you've sold the gift certificate to someone and collected their cash you still need to deliver goods, I'll use the example of a $100 yoga lesson. The flow happens by selling the initial gift card for $100 which will debit a cash account such as Visa or American Express and credit the other current liability Gift Certificates account which shows that you owe $100 in services to someone. When the $100 gift cerficate is then redeemed you will debit the other current liability account Gift Certificates because you've delivered on the service and credit your income account because the service has now been completed and should be realized as income. Other - If you have other payment type categories you will need to figure out how to account for them. Feel free to reach out with any specific questions. Various Service Types - These are income accounts and should be credited in your journal entry. 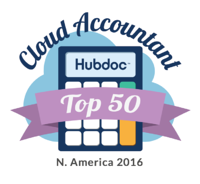 The level of detail or number of service category income accounts is entirely up to you. Product Categories - These are income accounts and should be credited in your journal entry. I typically set up a main account called 'retail sales.' If you wish to break products into more detail you are welcome to set up additional income accounts. Gift Certificates - In this section these are gift certificate sales. However, do not make the mistake of recording this as income. The gift certificates account should be set up as an other current liability and credited for gift certificate purchases in this section. The sale is recorded when the gift certificate is redeemed for goods and services. A further explanation can be found above. Sales Tax - Sales tax collected should credit your 'Sales Tax Payable' liability account in QuickBooks. This liability account is then brought down when a payment is made to the State Sales Tax Comission. I understand that it may be confusing to use the same liability account for account funds used and account funds redeemed as well as gift certificates redeemed and gift certificates purchased. However, it is important to understand these are liabilities to the company. Purchases increase the liability and redemptions reduce the liability. The sale is recorded when redemptions occur. If you are having difficulties tying your MINDBODY credit card payment activity to your bank account you are not alone. I have narrowed down the issue to swiped and keyed transactions, though it does not seem to affect American Express transactions. If your daily sales report does not tie to the merchant deposits hitting your bank you may need to look into the keyed and swiped transactions. For some reason some MINDBODY clients have their keyed and swiped credit card payments hit the bank separately. If this is the case you may need to break out that level of detail in your sales journal entry. You can find the details of the settled transactions on the bottom of your daily closeout report for the previous day's sales. This picture screen shot should shed some light on the issue for you. Getting MINDBODY sales data into QuickBooks accurately is not terribly difficult. This article may seem long and detailed but overall the process should only take a few minutes. The key step is setting up your memorized daily sales journal entry correctly. It is important to get your debits and credits correct as well as to select the correct account type for each line on your daily closeout report. If you are having any issues at all please feel free to reach out and I will be happy to assist you with setting up your QuickBooks sales journal entry.